After being fired by the attorney general in March, a former top FBI official requested records from the bureau citing the federal freedom of information law. However, he was quick to discover that the agency he led for a brief period last year isn’t really that into transparency or the rule of law after all. Andrew McCabe, who was the acting FBI director following the firing of James Comey last year, filed a lawsuit against the bureau on Tuesday after it failed to produce a slew of records requested under the Freedom of Information Act (FOIA). The FBI and the Justice Department proved less than cooperative. 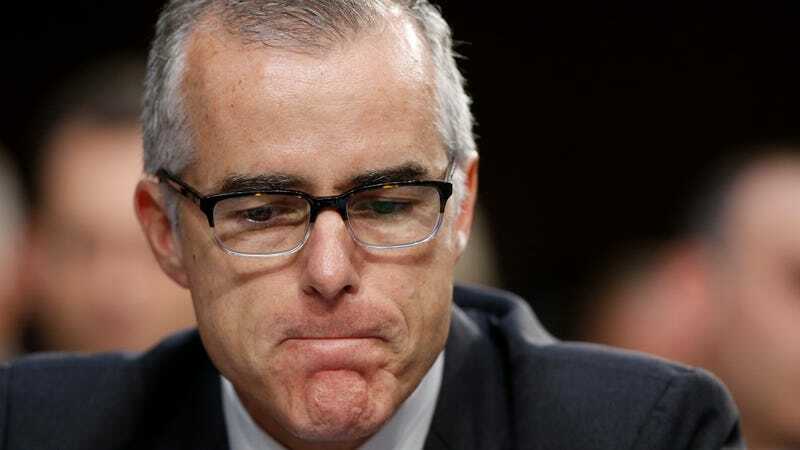 McCabe was fired by Attorney General Jeff Sessions in March after stepping down as the FBI’s deputy director in late January. In April, the Justice Department Inspector General’s Office (OIG) concluded that McCabe had violated agency rules by allowing subordinates to share details about an ongoing FBI probe with reporters. Citing a public-interest exception, McCabe has said he allowed officials to speak with reporters to correct a false narrative being reported to protect the FBI’s institutional reputation. He has denied the allegations contained in the OIG report, claiming he was misunderstood, and later alleged his firing was politically motivated. In a complaint filed Tuesday with the D.C. District Court, McCabe criticized the FBI over its “continuing pattern and practice of violating the proactive disclosure requirements of FOIA and applicable regulations.” McCabe has sought access to several documents that may be relevant to his own firing, such as internal policies for FBI-media interaction, and argued that some should have been made automatically public years ago. In regards to FOIA, the FBI is notoriously noncompliant. Often it takes absurd amounts of time to gain access to FBI records, even when their immediate disclosure is clearly in the public’s interest. Several years to process legitimate, non-exempt requests is not uncommon. That a career FBI official of some 22 years had the occasion to gripe about the bureau’s lack of transparency and disregard for FOIA regulations is, well, kind of priceless—at least, to anyone who’s ever battled the bureau for access to records that should be made public. McCabe’s aforementioned FOIA requests seek access to a wide range of FBI documents, a majority of them unclassified manuals and policy directives; the FBI Manual of Administrative Operations and Procedures; its media relations policy; and the FBI Domestic Investigations and Operations Guide, to name a few. “I profoundly identify with Mr. McCabe’s frustration and welcome him to the family with open arms,” FOIA attorney Dan Novack told Gizmodo. In particular, the McCabe complaint argues the FBI has habitually violated FOIA’s subsection (a)(2), which requires federal agencies to continuously and proactively disclose records that should be made available to the public, even before someone asks to see them. Although it’s debatable whether the FBI ever took heed, federal agencies were at least advised by DOJ in 2009 to “systematically post information online in advance of any public request.” “Providing more information online reduces the need for individualized requests and may help reduce existing backlogs,” the department wrote. And with that, Mr. McCabe, welcome to the resistance.